1Instituto de Investigaciones Agropecuarias, INIA Quilamapu, Av. Vicente Mendez 515, Chillán, Chile. *Corresponding author (mesepulve@inia.cl). 2Universidad de Concepción, Facultad de Agronomía. Av. Vicente Mendez 595, Chillán, Chile. Aegorhinus superciliosus is an important pest on blueberry (Vaccinium corymbosum L.) and other fruit trees. The use of entomopathogenic fungi as Metarhizium spp. has been evaluated for the control of this insect, but variability has been observed among different strains. The aim of this study was to characterize six promising strains of Metarhizium spp. for the control of A. superciliosus. 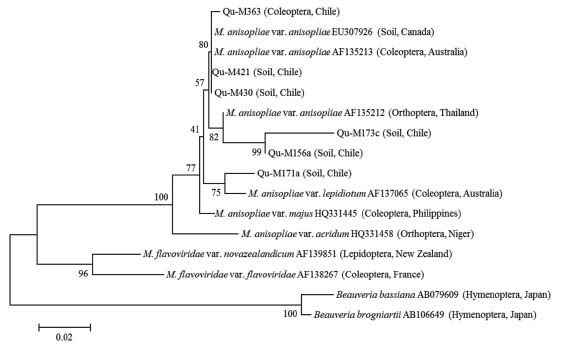 The studied strains were QuM173c, Qu-M363, Qu-M171a, Qu-M156a, Qu-M421, and Qu-M430, all of which belonged to the Chilean Collection of Microbial Genetic Resources (ChCMGR) of the Institute) de Investigaciones Agropecuarias (INIA), Chile. Molecular characterization was made by sequencing the ITS region (Internal Transcribed Spacers, ITS-5.8S rDNA). The morphology of conidia was evaluated through scanning electron microscopy and radial colony growth was evaluated in potato dextrose agar (PDA), Sabouraud dextrose agar (SDA), agar enriched with larvae of Galleria mellonella (Lepidoptera: Pyralidae) (GA), and agar enriched with adults of A. superciliosus (AA). Pathogenicity was studied based on mortality of adults of A. superciliosus inoculated with conidia. Sequencing of the ITS-5.8S rDNA region indicates that the strains belong to the clade of M. anisopliae var. anisopliae, except for Qu-M171a, which was identified as M. anisopliae var. lepidiotum. Conidia average length for the six strains was 5.09 pm and average conidia width was 1.92 pm. Radial colony growth differences were observed between strains (p < 0.01) and between different growth media (p < 0.01). The strains exhibited the highest colony growth in the GA medium, while in the AA medium they showed the lowest (p < 0.01). Pathogenicity tests show that Qu-M430 reached a 90% mortality rate (p < 0.01). Results show that there is variability between the studied strains, which is expressed in their morphology, molecular characteristics and pathogenicity towards A. superciliosus. Key words: Aegorhinus superciliosus, biological control, entomopathogen, Metarhizium anisopliae, radial growth, ITS regions (Internal Transcribed Spacers). Expansion of the area destined to berries production in Chile, which currently surpasses 14 500 ha (ODEPA, 2014), has been primarily through native forests replacement, forcing native insects into a change of habitat (Parra et al., 2009). Thus native insects have become pests in commercial crops and orchards, causing substantial economic losses (Aguilera, 1995). Such is the case of Aegorhinus superciliosus (Coleoptera: Curculionidae), a species present in Chile from Maule Region to Los Lagos Region (Arias, 2009; Zavala et al., 2011), closely related to Fagaceae forests (Elgueta, 1974), and currently affecting blueberry (Vaccinium corymbosum L.), raspberry (Rubus idaeus L.), blackcurrant (Ribes nigrum L.), blackberry (Rubus constrictus Lefevre & P.J. Mull. ), gooseberry (Ribes grossularia L.), and hazelnut (Corylus avellana L.) (Carrillo, 1993; Grau et al., 2001). Damage by A. superciliosus is caused mainly by its larval stage, which feeds on roots and bores the crown of the host plant, usually causing its death. Although the adult damages fruits and sprouts, in most cases it is not a severe problem for the affected orchards (Cisternas et al., 2000). Control of A. superciliosus is based on the use of chemical products on adults of this species. In this sense, Aguilera (1995) states that nonselective organophosphorus pesticides such as azinphos, azinphos-ethyl, and azinphos-methyl are effective for the control of adults in semi-controlled conditions, while Carrillo (1993) recommends the utilization of pesticides of the carbamate family. Despite this, it is possible to use biological control strategies relying on entomopathogenic fungi such as Metarhizium anisopliae (Metschn.) Sorokin and Beauveria bassiana (Bals.-Criv.) Vuill., which are widely used in integrated pest control programs around the world against different species of insects harmful to crops, with currently 13 species or subspecies of both fungi formulated and registered as mycopesticides or mycoacaricides (De Faria and Wraight, 2007). Metarhizium anisopliae is found in nature, in the soil, as saprophyte and in parasitized hosts. It was the first entomopathogenic fungi mass produced for its use as a pest control agent because of its pathogenic effect towards seven different orders of insects (Roberts and St. Leger, 2004). Even if the range of hosts susceptible to the action of M. anisopliae as a species is wide, different strains can direct their action only to specific hosts (Schrank and Vainstein, 2010). In Chile, screening of different strains of M. anisopliae on Curcullionid species (Aegorhinus superciliosus, Asynonychus cervinus and Otiorhynchus sulcatus) showed a great diversity on insect mortality (France et al., 2000). Diversity between Metarhizium isolates can also be expressed in chlleanjar morphological characteristics as size and pigmentation of the conidia (Schrank and Vainstein, 2010) and in virulence factors such as germination, vegetative growth and formation of conidia, which are influenced by the strain of the fungi and nutritional factors of the growth media (Shah et al., 2005). Consequently, the aim of this work was to characterize six strains of Metarhizium spp. from a molecular point of view, its growth in different growth media, and to evaluate the pathogenic effect of these strains on adult Aegorhinus superciliosus. Adults of A. superciliosus were collected from organic blueberry (V. corymbosum L.) and blackcurrant (R. nigrum L.) orchards of the Biob'o Region (36°33'47" S; 71°47'48" W), Chile, and carried to the Biological Control Technological Center (CTCB), Instituto de Investigaciones Agropecuarias INIA, Chillán. Insects were fed with blueberry leaves and branches previously disinfected with sodium hypochlorite, and were kept individually in plastic containers at 25 °C. Larvae of Galleria mellonella (Lepidoptera: Pyrelidae) were obtained from the rearing established by CTCB. The fungal strains belonged to the ChCMGR. Six strains of M. anisopliae were selected based on France et al. (2000) work: QuM173c, Qu-M363, Qu-M171a, Qu-M156a, Qu-M421, and Qu-M430, which were grown in potato dextrose agar (PDA) and incubated at 25 ± 2 °C for 15 d to obtain inoculum for the assays. The genomic DNA of the fungi was extracted from the mycelium in active growth using the methodology described by Cooke and Duncan (1997). The mycelium was homogenized in 200 μL extraction buffer (1 M Tris HCl, pH 7.5; 5 M NaCl EDTA pH 8.0; 10% SDS) and then 800 μL extraction buffer were added until completing 1 mL, 500 μL of the mixture were then transferred to an Eppendorf tube and incubated at 65 °C for 35 min, time after which the material was homogenized again through the inversion of the tube, at 65 °C for another 35 min. Then, the macerated product was centrifuged at 13 000 rpm for 5 min at 25 °C. After that, 350 μL of the supernatant were transferred to a new Eppendorf tube, to which 325 μL of cold isopropanol (-20 °C) were added, it was homogenized and incubated at room temperature for 14 min. Samples were later centrifuged at 13 000 rpm for 10 min at 25 °C. The supernatant was immediately discarded and the pellet was suspended in 500 μL of 70% ethanol. It was centrifuged at 13 000 rpm for 2 min at 25 °C to then eliminate the ethanol. The pellet was dried in an oven at 35 °C for 30 min, then suspended in 100 of water free of nuclease and finally stored at -20 °C. One micro liter of DNA was suspended in a final volume of 50 |iL Polymerase Chain Reaction (PCR) mixture containing 0.5 |iM ITS1 (5' TCCGTAGGTGAACCTGCGG 3V) primer, 0.5 |iM of ITS4 (5V TCCTCCGCTTATTGATATGC 3V) primer, 0.2 |iM deoxynucleotides, 1.5 mM MgCl2 and 1x buffer, and one unit of polymerase DNA (Invitrogen, Thermo Fisher Scientific, Waltham, Massachusetts, USA). PCR conditions were: 95 °C for 7 min; 35 cycles at 94 °C for 1 min, 55.5 °C for 30 s, and 72 °C for 1 min, as well as a final step at 72 °C for 10 min. The PCR products were separated in a 1% agarose gel with 0.5x TBE buffer (45 mM tris-borate, 1 mM EDTA, and pH 8). After electrophoresis, the gel was dyed with ethidium bromide and visualized under UV light. The PCR products were sequenced by Macrogen Inc. (Seoul, Korea). Sequence analysis results were aligned with the published full length sequences in the Basic Local Alignment Search Tool (BLAST) databases (NCBI, 2014) using Gen Tool Program. Phylogenetic trees were constructed from the aligned ITS-5.8S rDNA sequence data according to the neighbor-joining method (Saitou and Nei, 1987) using Mega 5.2 Software (Tamura et al., 2011). In order to characterize conidia, three pieces of 1 cm2 were cut from the edges of the colonies in active growth and were deposited in test tubes with 10 mL of 2.5% glutaraldehyde as fixative, and kept at 4 °C for 24 h. Then, each sample was taken out of the glutaraldehyde, removing the excess, and washed three times with 0.1 M phosphate buffer pH 7.2, to then be fixed on 1% osmium tetroxide for 12 h. Dehydration was carried out in increasing concentrations of alcohol at 30%, 50%, 70%, 80%, 90%, and 100%. The samples were then washed three times in 100% acetone and underwent critical point drying to finally make the inclusion and cuts to the sample (Vásquez y Echeverr'a, 2000). Each sample was observed through scanning electron microscopy (Autoscan U-1, ETEC Systems, Hayward, California, USA). The media used to evaluate morphology and radial growth of the colonies of the strains were potato dextrose agar (PDA), Sabouraud dextrose agar (SDA), agar enriched with larvae of G. mellonella (Galleria agar, GA: 3.6% agar w/v, 3% glucose p/v and 7% G. mellonella larvae w/v) and agar enriched with adult A. superciliosus (Aegorhinus agar, AA: 3.6% agar w/v, 3% glucose w/v and 7% adult A. superciliosus w/v). Insects used in the growth media were previously macerated, filtered with nylon net and later incorporated to the growth media previous to their sterilization. Growth media were inoculated by using a 5 mm mycelium disc from 5 d old PDA grown cultures and incubated at 25 ± 2 °C for 14 d (Hoe et al., 2009). Radial growth of the colonies was measured in four different points and registered daily. A completely randomized design with four replicates per treatment was used. The experiment was carried out twice, and the results were submitted to ANOVA to determine if there was any difference between the experiments. The radial growth was expressed as a proportion of the radial growth of the first day. Accumulated radial growth data till day 14 was submitted to ANOVA (p < 0.01) and the groups were separated through the Tukey's test (p < 0.01). In order to evaluate the pathogenic effect of the different strains on adults of A. superciliosus, suspensions of 1 x 107 conidia mL-1 were prepared, and their concentration was corroborated using microscope and hemacytometer. The control treatment consisted of distilled water and Tween 80 (0.02% v/v). Applications were made through microsprinkling with a Potter tower (Potter, Burkard Manufacturing, Rickmansworth, UK) with a pressure of 1.054 kg cm-2, applying 1 mL of suspension. Later, insects were kept at 25 °C with a 12:12 h photoperiod. A completely randomized design with five replicates per treatment was used. Each replicate consisted of 10 adult A. superciliosus, locked in adapted plastic containers. Mortality was observed daily for a period of 14 d. Dead insects were retired from the container and transferred to a wet chamber to confirm the presence of the fungi. Mortality data were corrected using square root transformation (Vy+1/2) (Sokal and Rohlf, 2013) and performed an ANOVA followed by Tukey's test (p < 0.05). Amplification of the ITS-5.8S rDNA region rendered a unique product for all the isolations, of an approximate size of 550 bp (Figure 1). Phylogenetic analysis positioned all the strains as part of the species M. anisopliae (Figure 2). Strains Qu-M363, Qu-M421, and Qu-M430 proved to be very close to each other, and they were all clustered in the M. anisopliae var. anisopliae clade. Strains Qu-M173c and Qu-M156a were in the same clade, nonetheless, the genetic distance of these strains in respect to M. anisopliae var. anisopliae AF135212 could suggest a new variety or subtype. 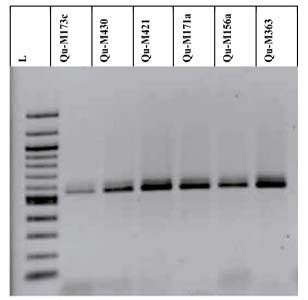 Strain Qu-M171a is far from the other strains and shares the clade with M. anisopliae var. lepidiotum, described by Driver et al. (2000). According to Driver et al. (2000) and Bischoff et al. (2009), this variety has been isolated from coleoptera collected only in Australia, New Zealand, and adjacent islands from the Pacific, which does not coincide with the geographical origin of the strain Qu-M171a, isolated from the south of Chile. The results show that the ITS-5.8S rDNA region allows the identification of these strains of entomopathogens at a species level, but in order to discriminate between varieties, sequencing of other conserved genes or the construction of specific primers would be necessary. Figure 1. PCR products amplified with ITS1-ITS4 primers from six strains of Metarhizium spp. (L corresponds to 1 kb DNA ladder). Figure 2. Neighbor joining phylogenetic tree based on ITS-5.8S rDNA gene sequencing of six strains of Metarhizium spp. The strains sequences in the phylogram were obtained from GenBank (accession numbers in capital letters). Information in parenthesis indicates original host and geographic origin. The strains presented hyaline cylindrical conidia, with round edges and olive green coloring characteristic of M. anisopliae (Figure 3). The values of length conidia are different (p < 0.01) and vary between 4.52 and 5.54 pm to the strains Qu-M171a and Qu-M430, respectively. The strain that had the minimum width was Qu-M156a and the maximum values was observed in the strain M421 (p < 0.01) (Table 1). The values of length and width are in the range described for M. anisopliae var. anisopliae (Bischoff et al., 2009; Fernandes et al., 2010). But, these results are not consistent with the molecular identification of isolate Qu-M171a, since according to Driver et al. (2000) conidia of M. anisopliae var. lepidiotum have a length of between 7.3 and 10.6 _pm and a width of between 3 and 4.1 pm, which is different from what was observed in this study regarding the measures of this strain (Table 1). Figure 3. Morphology of conidia and colonies of six strains of Metarhizium anisopliae in different growth media after 14 d from the inoculation. Table 1. Size of the conidia of the six strains of Metarhizium anisopliae grown in potato dextrose agar after 14 d of incubation. Different letters in the column indicate significant differences (Tukey's test, p < 0.01). ± Corresponds to standard deviation. 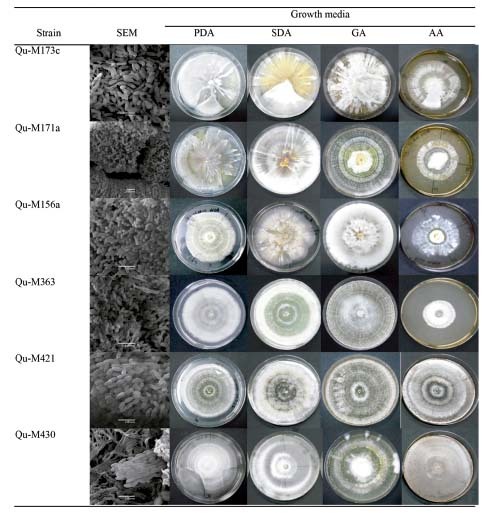 The six strains showed different morphologic characteristics in the different growth media, but most of them formed circular colonies and a milky mycelium (Figure 3). Strains Qu-M173c and Qu-M171a grown in SDA and GA showed an orange-yellow background (Figure 3). The mycelium texture was thin and stuck to the surface of the growth, except the strains Qu-M171a and Qu-M363 grown in AA and Qu-M156a GA. These showed a thicker, cottony mycelium (Figure 3). Strain Qu-M430 grown in AA presented a mycelium with thin hyphae and stuck to the surface of the growth medium (Figure 3). Some of the strains showed green conidia rings that covered the colony completely, as Qu-M421 grown in the four media and Qu-M171a, Qu-M363, and Qu-M430 grown in GA (Figure 3). It was also observed that the growth medium affects the sporulation of the different strains, though the evaluation of this characteristic was not part of the study. Our results agree with those obtained by Hoe et al. (2009), who observed morphological differences with the addition of yeast extract to PDA and SDA. Metarhizium anisopliae strains radial growth was evaluated as accumulated growth after 14 d from the inoculation. GA medium promoted significant radial growth in all strains (p < 0.01) (Figure 4), while AA medium showed the minimum radial growth for all evaluated strains (p < 0.01). Figure 4. 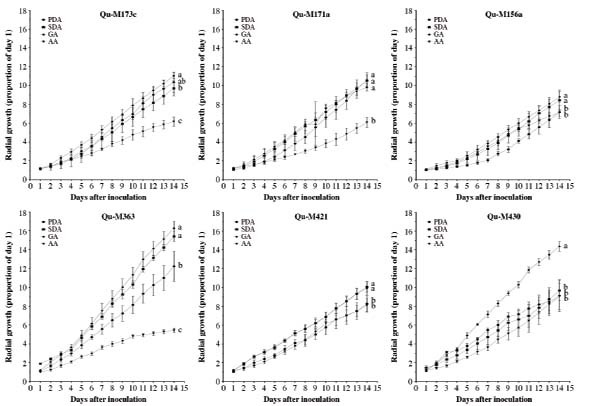 Radial growth of six strains of Metarhizium anisopliae grown in different solid media. Different letters for each strain indicate differences between the growth media according to the Tukey's test (p < 0.01). Vertical bars indicate standard error. PDA: Potato dextrose agar; SDA: Sabouraud dextrose agar; GA: agar enriched with Galleria mellonella; AA: agar enriched with Aegorhinus superciliosus. Incorporation of insects into the growth media caused dissimilar results. GA cultures were faster, forming larger colonies, compared to the growth in AA. The strain that achieved the highest growth in AA was Qu-M430 (Figure 4), described as pathogenic for A. superciliosus (France et al., 2000). González et al. (2001) point out that the integument of the insect susceptible to the action of a determined strain of the entomopathogenic fungi would provide the necessary conditions for the germination of conidia and the growth of hyphae, so its addition to the solid growth media could increase the pathogenicity of the microorganisms towards the pest. Similarly, Pedrini et al. (2007) suggest that strains of the entomopathogenic fungi adapted to cultures in media similar to the composition of the cuticle of the susceptible insect could effectively increase their virulence. Nonetheless, the need to produce enzymes to be able to use the culture media as a substrate for growth could cause that growth rate and size of the colonies to be inferior to those of other culture media. The highest growth, achieved on the GA media, could be explained by the composition of the integument of the larvae of G. mellonella, which should content less chitin than the media enriched with adults of A. superciliosus, and therefore require less enzymatic activity to hydrolyze the necessary nutrients for the growth of the fungi, since these would be more available. Freimoser et al. (2005) showed that enzymatic activity is coded by genes that would have a differential regulation depending on the cuticle of the host in which they are found; these increase the flexibility of M. anisopliae to respond to nutritional changes. PDA and SDA are widely used to growth fungi, however our results showed that the radial growth of the different strains was erratic (Figure 2). Moreover, successive cultures of entomopathogenic fungi in these media have the disadvantage of negatively affecting virulence, increasing the lethal time and dose (Nahar et al., 2008), and decreasing the adhesion of the conidia to the cuticle of the insect (Shah et al., 2007), decreasing conidia production and their ability to tolerate UV radiation (Santoro et al., 2014). The strains showed significant differences in their pathogenicity towards A. superciliosus (p < 0.01). The most pathogenic strain was Qu-M430 (Table 2), reaching 90% mortality through the inoculation of adult A. superciliosus with conidia. This result agrees with the informed by France et al. (2000). Some studies suggest that control of Curculionidae insect pests should be focused on egg and larval stages, since the action of the entomopathogen would be faster than when applied on adults (Gindin et al., 2006); on the other hand, applications on female adults, as in Xylosandrus germanus (Coleoptera: Curculionidae), would have the advantage of an effect on the next generation, resulting on smaller individuals that acquire the entomopathogenic infection (Castrillo et al., 2011). Table 2. Mortality of adults of Aegorhinus superciliosus inoculated with different strains of Metarhizium anisopliae. Sequencing of the ITS-5.8S rDNA region allowed the identification of the strains at a species level, all of which belonged to Metarhizium anisopliae, but in order to identify the variety within the species it would be necessary to use specific primers. The morphological characteristics of the conidia of the studied strains coincide with those described for M. anisopliae. There is variability regarding their growth in different growth media and in their pathogenic effect towards Aegorhinus superciliosus. The potato dextrose agar, Sabouraud dextrose agar, Galleria agar, and Aegorhinus agar growth media are appropriate for the growth of the six strains of this study. Radial growth of the colony is faster in culture media enriched with Galleria mellonella larvae. It is possible to reach 90% mortality through the inoculation of adult A. superciliosus with conidia of M. anisopliae of the strain Qu-M430. This work was supported by the Comisión Nacional de Ciencia y Tecnología (CONICYT) and the Fondo de Innovación of the Biobío Region (Innova Bío Bío) 12.273. EM-TES. Aguilera, A. 1995. Control selectivo de plagas frutales de la zona sur. p. 141-180. En Aguilera, A., O. Andrade, J. Díaz, N. Espinoza, R. Galdamez, y H. Norambuena (eds.) Seminario de Proteccion Vegetal. Instituto de Investigaciones Agropecuarias, INIA Carillanca, Temuco, Chile. Arias, E. 2009. Coleopteros en Chile. Ocho Libros Editores Limitada, Santiago, Chile. Cisternas, E., A. France, L. Devotto y M. Gerding. 2000. Insectos, acaros y enfermedades asociadas a la frambuesa. Instituto de Investigaciones Agropecuarias, INIA Quilamapu, Chillán, Chile. Elgueta, M. 1974. Una nueva especie de Aterpinae (Coleoptera: Curculionidae). Revista Chilena de Entomologia 8:133-134. France, A., M. Gerding G., M. Gerding P., y A. Sandoval. 2000. Patogenicidad de una coleccion de cepas nativas de Metarhizium spp. y Beauveria spp. en Aegorhinus superciliosus, Asynonychus cervinus, Otiorhynchus sulcatus. Agricultura Tecnica 60:205-215. ODEPA. 2014. Superficie de frutales por region. Oficina de Estudios y Politicas Agrarias (ODEPA), Santiago, Chile. Available at http://www.odepa.cl/superficie-de-frutales-por-region-2/ (accessed August 2014). Sokal, R.R., y F.J. Rohlf. 2013. Introducción a la bioestadística. Editorial Reverté, Barcelona, España. Zavala, A., M. Elgueta, J. Abarzúa, A. Aguilera, A. Quiroz, and R. Rebolledo. 2011. Diversity and distribution of the Aegorhinus genus in the La Araucanía Región of Chile, with special reference to A. superciliosus and A. nodipennis. Ciencia e Investigacion Agraria 38:367-377.